Easy Easter nest cookies are an easy, no bake treat that kids and adults will love. 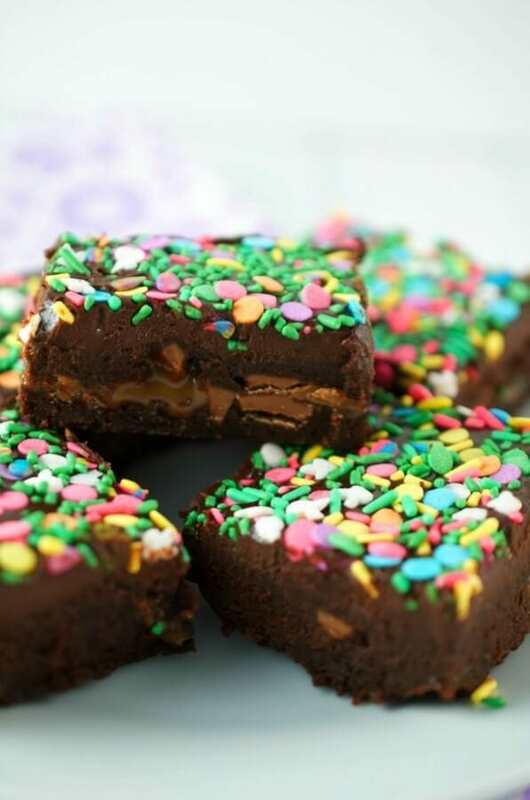 Chewy, chocolatey and so adorable, plus it’s a recipe using mini Cadbury Eggs! Have you ever made haystack cookies? They’re soft, chewy, no bake chocolate oatmeal cookies. 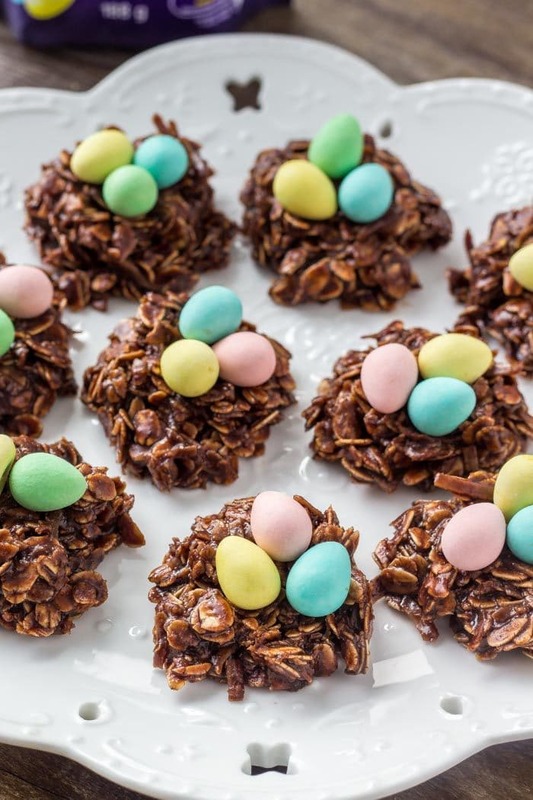 These Easy Easter nest cookies are a super adorable version of haystack cookies that you can make for spring using chocolate miniature eggs or jelly beans. This Edible Playdough is also something super fun to make for the kids! Every year at Easter my grandmother would spoil us. 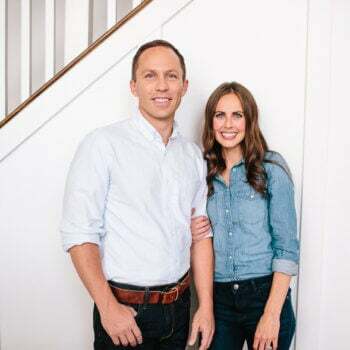 She’d do a huge Easter egg hunt with literally hundreds of chocolate eggs, and she’d make so many homemade Easter treats. There’s lots of photos of me in my Easter Sunday dress looking for eggs in her yard – and definitely 1 or 2 where I have chocolate on my cheeks too. One of my favorite treats that she’d make was these Easy Easter nest cookies, so today I’m sharing the recipe with you. 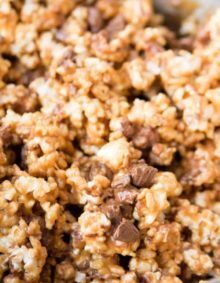 It’s a really easy no bake recipe, and there’s no fancy ingredients needed. To get started, in a sauce pan you’ll melt together the butter, milk, sugar, and cocoa powder over low heat. It’ll come to a gently boil, and continue whisking as it boils for 5 minutes. It needs to boil for this time, otherwise the cookies won’t really stick together. Then remove the pan from the heat and stir in the oats and coconut. 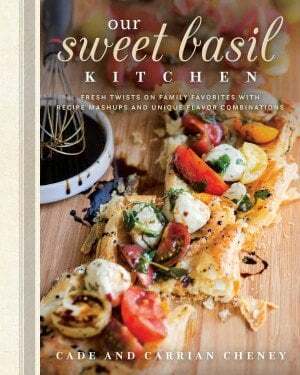 You can use old fashioned oats or quick oats, and you can use sweetened or unsweetened coconut. Then drop spoonfuls of the batter onto a cookie sheet lined with wax paper. At this point you can form the haystacks into more uniform nest shapes, or leave them a little messier. It’s totally up to you. Then place a few mini egg candies in the middle of each nest, and place in the fridge to harden. Being a chocolate lover myself, I love to use the candy coated miniature chocolate eggs – like Eggies or Cadbury Mini Eggs. But I’ve also made these with jelly beans too, which is always a favorite. 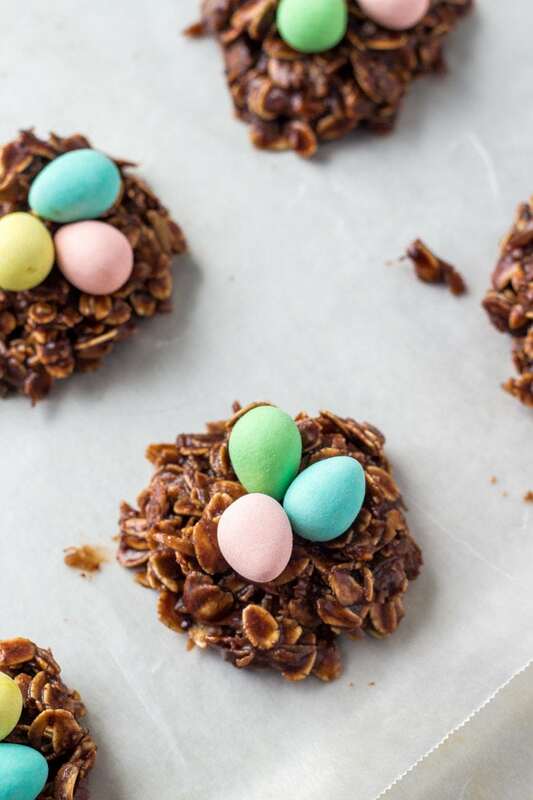 These Easy Easter nest cookies are such a cute treat for springtime, and if you’re looking for an easy Easter recipe – then this one’s definitely for you. 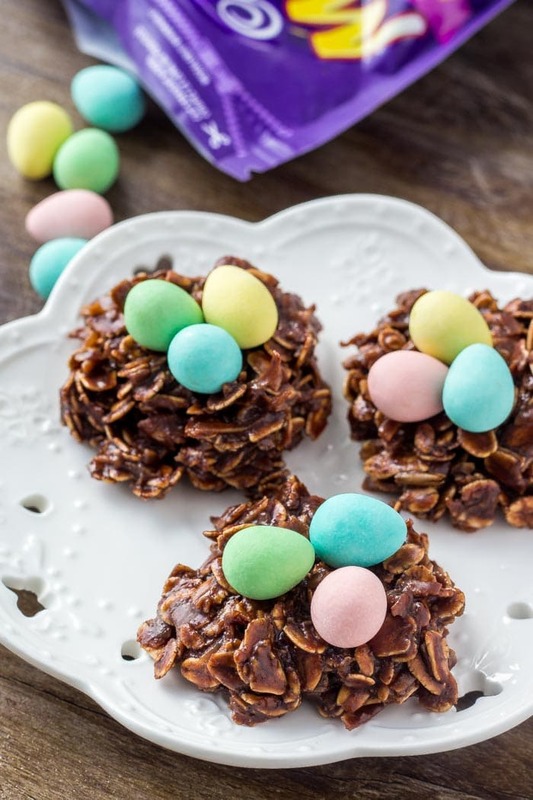 Easy Easter nest cookies are an easy, no bake treat that kids and adults will love. Chewy, chocolatey and so adorable. Line 2-3 cookie trays with wax paper. In a medium saucepan melt together the butter, milk, sugar and cocoa powder while whisking until no lumps remain. Bring to a gently boil for 5 minutes as you continue to whisk the mixture. Remove from the heat and stir in the oats and coconut. Drop tablespoon sized cookies onto the lined trays and place 2-3 mini eggs in the middle of each. 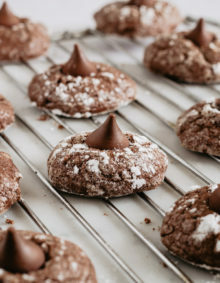 You can shape the cookies with your fingers for more uniform nests. Place the trays in the fridge for 45 minutes to set. 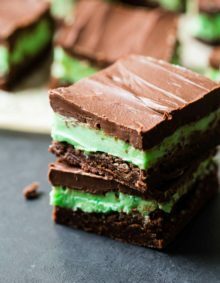 These fudgy caramel egg brownies are super decadent and the perfect Easter treat if you love chocolate. 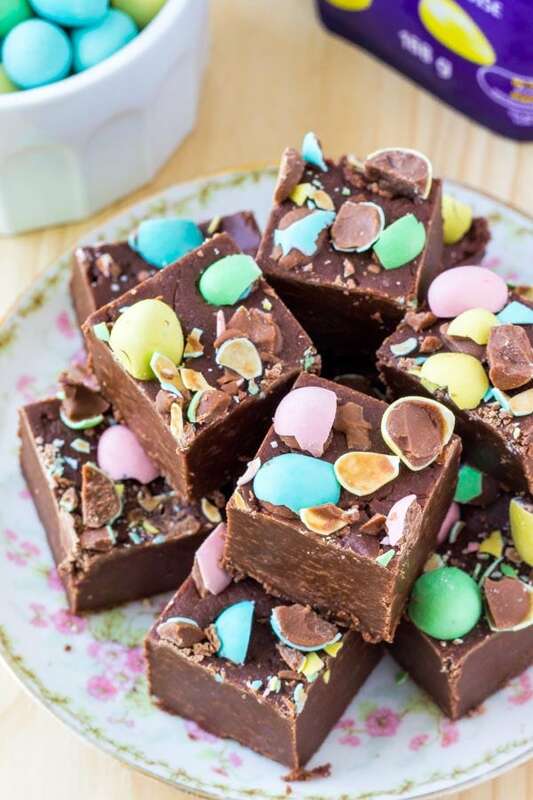 If you’re looking for more Easter treats – be sure to try this chocolate fudge recipe. It’s smooth and creamy, then topped with mini eggs.